We often hear about the growing divide between rich and poor in America. This compelling exposé, backed by up-to-date research, locates the source of this trend where we might least expect to find it—in our schools. 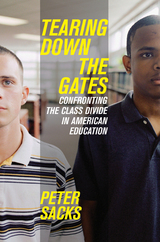 Written for a wide audience, Tearing Down the Gates is a powerful indictment of American education that shows how schools, colleges, and universities exacerbate inequality by providing ample opportunities for advantaged students while shutting the gates on the poor—and even the middle class. Peter Sacks tells the stories of young people and families as they struggle to negotiate the educational system. He introduces students like Ashlea, who grew up in a trailer park and who would like to attend college, though she faces constant obstacles that many of her more privileged classmates can't imagine. Woven throughout with voices of Americans both rich and poor, Tearing Down the Gates describes a disturbing situation that has the potential to undermine the American dream, not just for some, but for all of us. At the heart of this book is a question of justice, and Sacks demands that we take a hard look at what equal opportunity really means in the United States today. Peter Sacks is an author, essayist, and social critic who writes and speaks extensively on education and American culture. He is author of Generation X Goes to College: An Eye-Opening Account of Teaching in Postmodern America and Standardized Minds: The High Price of America's Testing Culture and What We can do to Change it. His essays have appeared in The Nation, The Chronicle of Higher Education, The Boston Review, the Los Angeles Times, The New York Times, and other publications. 15. Where Are We Going?